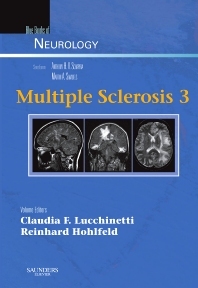 Multiple Sclerosis 3 emphasizes the latest in the pharmacologic treatment of this incurable inflammatory demyelinating disorder. Primary editors Claudia Lucchinetti, MD, and Reinhard Hohlfeld, MD, with the aid of all new contributors, present a complete and current reference on multiple sclerosis that includes discussions of such hot topics as Biomarkers, Genomics, and Surrogate Outcomes in MS; Pediatric MS; Transverse Myelitis; Attack Therapies in MS; Current Disease-Modifying Therapeutic Strategies in MS; Management of Aggressive MS; Symptomatic Therapies in MS; Complementary and Alternative Medical Therapies; and Strategies to Promote Neuroprotection and Repair. Distinguish between MS and other similar demyelinating disorders and know the best and most aggressive methods of treatment. This title in the Blue Books of Neurology series is exactly what you need to treat the disease and its relapses. Covers the latest clinical advances and relevant discussions—Biomarkers, Genomics, and Surrogate Outcomes in MS; Pediatric MS; Transverse Myelitis; Attack Therapies in MS; Current Disease-Modifying Therapeutic Strategies in MS; Management of Aggressive MS; Symptomatic Therapies in MS; Complementary and Alternative Medical Therapies; and Strategies to Promote Neuroprotection and Repair—to bring you up to date and keep your practice state-of-the-art. Features a greater emphasis on practical management to help you determine the type of multiple sclerosis and the best course of therapy. Focuses on pharmaceutical therapies so you know the best and most aggressive methods and which drugs to use for treatment. Includes extensive information on differential diagnosis so that you can clearly distinguish between multiple sclerosis and other similar demyelinating disorders. Presents expert new editors and experienced contributing authors for the most current and relevant practice information. Emphasizes the pharmacologic management of patients with multiple sclerosis to address treating the actual disease and its relapses as well as treating the symptoms.